Electrical resistivity (also known as specific electrical resistance) is a measure of how strongly a material opposes the flow of electric current. A low value of resistivity indicates a material that readily allows the movement of electrical charge. The SI unit of electrical resistivity is the ohm meter (Ω-m). Knowledge of the resistivity of various materials is useful for the choice of materials needed for manufacturing electrical and electronic components. A is the cross-sectional area of the specimen (measured in square meters, m²). J is the magnitude of the current density (measured in amperes per square meter, A/m²). Teflon 1022 to 1024 ? n=2 implies that the resistance is due to electron-electron interaction. As the temperature of the metal is sufficiently reduced (so as to 'freeze' all the phonons), the resistivity usually reaches a constant value, known as the residual resistivity. This value depends not only on the type of metal, but on its purity and thermal history. The value of the residual resistivity of a metal is decided by its impurity concentration. Some materials lose all electrical resistivity at sufficiently low temperatures, due to an effect known as superconductivity. where A, B and C are the so-called Steinhart–Hart coefficients. 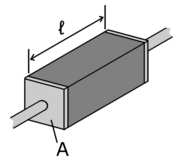 This equation is used to calibrate thermistors. In non-crystalline semi-conductors, conduction can occur by charges quantum tunnelling from one localized site to another. This is known as variable range hopping and has the characteristic form of , where n=2,3,4 depending on the dimensionality of the system. When analyzing the response of materials to alternating electric fields, as is done in certain types of tomography, it is necessary to replace resistivity with a complex quantity called impedivity (analogous to electrical impedance). Impedivity is the sum of a real component, the resistivity, and an imaginary component, the reactivity (analogous to reactance). In some applications where the weight of an item is very important, resistivity density products are more important than absolute low resistance. It is often possible to make the conductor thicker, to make up for a higher resistivity; and in that case, a low resistivity density product material (or equivalently a high conductance to density ratio) is desirable. This knowledge is useful for long-distance overhead powerline transmission. Aluminum is used rather than copper because it is lighter for the same conductance. Calcium, while theoretically better, is rarely if ever used, due to its highly reactive nature. ↑ 1.00 1.01 1.02 1.03 1.04 1.05 1.06 1.07 1.08 1.09 1.10 1.11 1.12 1.13 1.14 Raymond A. Serway, Principles of Physics, 2nd ed. (Fort Worth, TX; London: Saunders College Pub., 1998, ISBN 0030204577), 602. ↑ 2.0 2.1 2.2 2.3 David Griffiths, "Chapter 7. Electrodynamics." In Introduction to Electrodynamics, 3rd ed., edited by Alison Reeves (Upper Saddle River, NJ: Prentice Hall,  1999, ISBN 013805326X), 286. ↑ 3.0 3.1 3.2 Douglas C. Giancoli, Physics: Principles with Applications, 4th ed. (London: Prentice Hall, 1995, ISBN 0131021532). See also Table of Resistivity and Temperature Coefficient at 20 C. Retrieved August 25, 2008. ↑ Ni,Fe,Cr alloy commonly used in heating elements. ↑ 5.0 5.1 5.2 The resistivity of semiconductors depends strongly on the presence of impurities in the material. ↑ Otto H. Schmitt, Mutual Impedivity Spectrometry Retrieved August 25, 2008. All links retrieved July 9, 2015. Resistivity & Mobility Calculator/Graph for Various Doping Concentrations in Silicon Dept. of Electrical & Computer Engineering, Brigham Young University. This page was last modified on 9 July 2015, at 17:12.